Objective To identify features of clinical decision support systems critical for improving clinical practice. Data sources Literature searches via Medline, CINAHL, and the Cochrane Controlled Trials Register up to 2003; and searches of reference lists of included studies and relevant reviews. Study selection Studies had to evaluate the ability of decision support systems to improve clinical practice. Data extraction Studies were assessed for statistically and clinically significant improvement in clinical practice and for the presence of 15 decision support system features whose importance had been repeatedly suggested in the literature. Results Seventy studies were included. Decision support systems significantly improved clinical practice in 68% of trials. Univariate analyses revealed that, for five of the system features, interventions possessing the feature were significantly more likely to improve clinical practice than interventions lacking the feature. Multiple logistic regression analysis identified four features as independent predictors of improved clinical practice: automatic provision of decision support as part of clinician workflow (P < 0.00001), provision of recommendations rather than just assessments (P = 0.0187), provision of decision support at the time and location of decision making (P = 0.0263), and computer based decision support (P = 0.0294). Of 32 systems possessing all four features, 30 (94%) significantly improved clinical practice. Furthermore, direct experimental justification was found for providing periodic performance feedback, sharing recommendations with patients, and requesting documentation of reasons for not following recommendations. Conclusions Several features were closely correlated with decision support systems' ability to improve patient care significantly. Clinicians and other stakeholders should implement clinical decision support systems that incorporate these features whenever feasible and appropriate. Clinical decision support systems do not always improve clinical practice, however. In a recent systematic review of computer based systems, most (66%) significantly improved clinical practice, but 34% did not.4 Relatively little sound scientific evidence is available to explain why systems succeed or fail.23 24 Although some investigators have tried to identify the system features most important for improving clinical practice,12 25–34 they have typically relied on the opinion of a limited number of experts, and none has combined a systematic literature search with quantitative meta-analysis. We therefore systematically reviewed the literature to identify the specific features of clinical decision support systems most crucial for improving clinical practice. We searched Medline (1966-2003), CINAHL (1982-2003), and the Cochrane Controlled Trials Register (2003) for relevant studies using combinations of the following search terms: decision support systems, clinical; decision making, computer-assisted; reminder systems; feedback; guideline adherence; medical informatics; communication; physician's practice patterns; reminder$; feedback$; decision support$; and expert system. We also systematically searched the reference lists of included studies and relevant reviews. A study may include several trial arms, so that multiple comparisons may exist within the single study. For each relevant comparison, two reviewers independently assessed whether the clinical decision support system resulted in an improvement in clinical practice that was both statistically and clinically significant. In some cases changes in practice characterised as clinically significant by the study authors were deemed non-significant by the reviewers. We considered effect size as an alternative outcome measure but concluded that the use of effect size would have been misleading given the significant heterogeneity among the outcome measures reported by the included studies. We also anticipated that the use of effect size would have led to the exclusion of many relevant trials, as many studies fail to report all of the statistical elements necessary to accurately reconstruct effect sizes. Next, two reviewers independently determined the presence or absence of specific features of decision support systems that could potentially explain why a system succeeded or failed. To construct a set of potential explanatory features, we systematically examined all relevant reviews and primary studies identified by our search strategy and recorded any factors suggested to be important for system effectiveness. Both technical and non-technical factors were eligible for inclusion. Also, if a factor was designated as a barrier to effectiveness (such as “the need for clinician data entry limits system effectiveness”) we treated the logically opposite concept as a potential success factor (such as “removing the need for clinician data entry enhances system effectiveness”). Next, we limited our consideration to features that were identified as being potentially important by at least three sources, which left us with 22 potential explanatory features, including general system features, system-clinician interaction features, communication content features, and auxiliary features (tables 1 and 2). Of these 22 features, 15 could be included into our analysis (table 1) because their presence or absence could be reliably abstracted from most studies, whereas the remaining seven could not (table 2). We used three methods to identify clinical decision support system features important for improving clinical practice. Multiple logistic regression analyses—For these analyses, the presence or absence of a statistically and clinically significant improvement in clinical practice constituted the binary outcome variable, and the presence or absence of specific decision support system features constituted binary explanatory variables. We included only cases in which the clinical decision support system was compared against a true control group. For the primary meta-regression analysis, we pooled the results from all included studies, so as to maximise the power of the analysis while decreasing the risk of false positive findings from over-fitting of the model.58 We also conducted separate secondary regression analyses for computer based systems and for non-electronic systems. For all analyses, we included one indicator for the decision support subject matter (acute care v non-acute care) and two indicators for the study setting (academic v non-academic, outpatient v inpatient) to assess the role of potential confounding factors related to the study environment. With the 15 system features and the three environmental factors constituting the potential explanatory variables, we conducted logistic regression analyses using LogXact-5.59 Independent predictor variables were included into the final models using forward selection and a significance level of 0.05. Direct experimental evidence—We systematically identified studies in which the effectiveness of a given decision support system was directly compared with the effectiveness of the same system with additional features. We considered a feature to have direct experimental evidence supporting its importance if its addition resulted in a statistically and clinically significant improvement in clinical practice. Of 10 688 potentially relevant articles screened, 88 papers describing 70 studies met all our inclusion and exclusion criteria (figure).w1-w88 Inter-rater agreements for study selection and data abstraction were satisfactory (table 3). The 70 studies contained 82 relevant comparisons, of which 71 compared a clinical decision support system with a control group (control-system comparisons) and 11 directly compared a system with the same system plus extra features (system-system comparisons). We used the control-system comparisons to identify system features statistically associated with successful outcomes and the system-system comparisons to identify features with direct experimental evidence of their importance. Table 5 summarises the success rates of clinical decision support systems with and without the 15 potentially important features. Overall, 48 of the 71 decision support systems (68% (95% confidence interval 56% to 78%)) significantly improved clinical practice. For five of the 15 features, the success rate of interventions possessing the feature was significantly greater than that of interventions lacking the feature. Most notably, 75% of interventions succeeded when the decision support was provided to clinicians automatically, whereas none succeeded when clinicians were required to seek out the advice of the decision support system (rate difference 75% (37% to 84%)). Similarly, systems that were provided as an integrated component of charting or order entry systems were significantly more likely to succeed than stand alone systems (rate difference 37% (6% to 61%)); systems that used a computer to generate the decision support were significantly more effective than systems that relied on manual processes (rate difference 26% (2% to 49%)); systems that prompted clinicians to record a reason when not following the advised course of action were significantly more likely to succeed than systems that allowed the system advice to be bypassed without recording a reason (rate difference 41% (19% to 54%)); and systems that provided a recommendation (such as “Patient is at high risk of coronary artery disease; recommend initiation of β blocker therapy”) were significantly more likely to succeed than systems that provided only an assessment of the patient (such as “Patient is at high risk of coronary artery disease”) (rate difference 35% (8% to 58%)). Finally, systems that provided decision support at the time and location of decision making were substantially more likely to succeed than systems that did not provide advice at the point of care, but the difference in success rates fell just short of being significant at the 0.05 level (rate difference 48% (−0.46% to 70.01%)). The univariate analyses evaluated each potential success factor in isolation from the other factors. We therefore conducted multivariate logistic regression analyses in order to identify independent predictors of clinical decision support system effectiveness while taking into consideration the presence of other potentially important factors. Table 6 shows the results of these analyses. Of the six features shown to be important by the univariate analyses, four were identified as independent predictors of system effectiveness by the primary meta-regression analysis. Most notably, this analysis confirmed the critical importance of automatically providing decision support as part of clinician workflow (P < 0.00001). The other three features were providing decision support at the time and location of decision making (P = 0.0263), providing a recommendation rather than just an assessment (P = 0.0187), and using a computer to generate the decision support (P = 0.0294). Among the 32 clinical decision support systems incorporating all four features,w2-w6 w8-w10 w12 w16 w19 w20 w22 w24-w27 w32 w34-w49 w67 w69 w70 w88 30 (94% (80% to 99%)) significantly improved clinical practice. In contrast, clinical decision support systems lacking any of the four features improved clinical practice in only 18 out of 39 cases (46% (30% to 62%)). The subset analyses for computer based clinical decision support systems and for non-electronic clinical decision support systems yielded results consistent with the findings of the primary regression analysis (table 6). In this study, we systematically reviewed the literature in order to determine why some clinical decision support systems succeed while others fail. In doing so, we identified 22 technical and non-technical factors repeatedly suggested in the literature as important determinants of a system's ability to improve clinical practice, and we evaluated 15 of these features in randomised controlled trials of clinical decision support systems. We found five of the features were significantly correlated with system success, and one feature correlated with system success at just over the 0.05 significance level. Multiple logistic regression analysis identified four of these features as independent predictors of a system's ability to improve clinical practice. Furthermore, we found direct experimental evidence to support the importance of three additional features. This study has several important strengths. Firstly, our literature search was thorough, and we screened more than 10 000 articles to identify potentially relevant studies. Secondly, we generated the candidate set of potentially important system features by systematically reviewing the literature for relevant expert opinion, rather than by relying on the views of a limited set of experts. Thirdly, we used two independent reviewers for study selection and data abstraction to increase the reliability of our findings. Fourthly, this study provides a quantitative estimate of the relative importance of specific clinical decision support system features. Finally, this study provides a comprehensive summary of randomised controlled trials that have evaluated the importance of specific system features through direct experimentation. One limitation of this study is that we used a binary outcome measure rather than a continuous measure such as effect size. We therefore could not adjust for variations in the size of outcomes. Another potential criticism is that we pooled different types of clinical decision support systems in the regression analysis. However, we believe that our methods were appropriate given that our objective was to determine the impact of heterogeneity among interventions rather than to estimate the effects of a homogeneous intervention, as is usually the case for a meta—analysis. We did not conduct a subset analysis for studies in which patient outcome measures (as opposed to process measures) were evaluated—because the number of studies reporting patient outcome measures was too small to allow for an adequately powered regression analysis. Moreover, because we required an improvement in practice to be clinically significant in order to be counted as a success, our methods precluded an improvement in a trivial process measure from counting as a successful outcome. Our analyses were limited to published reports of randomised controlled trials. Thus, some of our findings may not be extendable to clinical decision support system categories for which we could not find any studies meeting our inclusion criteria, such as clinical decision support systems provided on personal digital assistants. Also, publication bias against studies that failed to show an effect might have limited our ability to identify features associated with ineffective systems. The sample size for our regression analysis was restricted by the size of the available literature. Thus, despite our best efforts to find and include all relevant studies, our ratio of cases to explanatory variables was suboptimal, especially for the subset regression analyses.58 60 As a result, we cannot rule out the importance of system features based on their absence from the final regression models. Also, it is possible that one or more features were falsely included into the regression models because of over-fitting. However, we do not believe this was the case, as our findings are consistent with our previous experiences of implementing clinical decision support systems in practice. An additional limitation is that our analyses were restricted to features that could be reliably abstracted. As a consequence, we were unable to assess the significance of several potentially important features (table 2). On a practical level, our findings imply that clinicians and other healthcare stakeholders should implement clinical decision support systems that (a) provide decision support automatically as part of clinician workflow, (b) deliver decision support at the time and location of decision making, (c) provide actionable recommendations, and (d) use a computer to generate the decision support. In particular, given the close correlation between automatic provision and successful outcomes (P < 0.00001), we believe that this feature should be implemented if at all possible. If a clinical decision support system must depend on clinician initiative for use, we recommend that system use be carefully monitored and steps be taken to ensure that clinicians access the resource as intended. A common theme among all four features is that they make it easier for clinicians to use a clinical decision support system. For example, automatically providing decision support eliminates the need for clinicians to seek out the advice of the system, and the use of a computer system improves the consistency and reliability of the clinical decision support system by minimising labour intensive and error prone processes such as manual chart abstractions. As a general principle, then, our findings suggest that an effective clinical decision support system must minimise the effort required by clinicians to receive and act on system recommendations. With regard to the three other system features shown to be important through direct experimentation, we think these features are important and desirable but not as crucial as the four features identified by our regression analysis. Thus, when feasible and appropriate, clinical decision support systems should also provide periodic performance feedback, request documentation of the reason for not following system recommendations, and share decision support results with patients. For the remaining clinical decision support system features listed in table 1, we consider them optional but still potentially beneficial, especially if they will make it easier for clinicians to use the clinical decision support system or if the univariate analyses found that they were substantially more likely to be present in successful systems than in unsuccessful ones (table 5). Finally, with regard to the seven clinical decision support system features that could not be included in our regression analysis (table 2), we recommend that they be considered potentially important, especially if they reduce the time, effort, or initiative required for clinicians to receive and act on system recommendations. The promise of evidence based medicine will be fulfilled only when strategies for implementing best practice are rigorously evidence based themselves.61 62 In order to fulfil this goal in the context of clinical decision support systems, two important research needs must be addressed. Firstly, reports of clinical decision support system evaluations should provide as much detail as possible when describing the systems and the manner in which clinicians interacted with them, so that others can learn more effectively from previous successes and failures. Secondly, further direct experimentation is warranted to evaluate the importance of specific system features. We thank Vic Hasselblad for his assistance with the statistical analyses. Contributors KK, DFL, and EAB contributed to the study design. KK, CAH, and DFL contributed to the data abstraction. All authors contributed to the data analysis. KK managed the project and wrote the manuscript, and all authors contributed to the critical revision and final approval of the manuscript. DFL is guarantor. Funding This study was supported by research grants T32-GM07171 and F37-LM008161-01 from the National Institutes of Health, Bethesda, Maryland, USA; and by research grants R01-HS10472 and R03-HS10814 from the Agency for Healthcare Research and Quality, Rockville, Maryland, USA. These funders did not play a role in the design, execution, analysis, or publication of this study. .The quality of health care delivered to adults in the United States.N Engl J Med2003; 348:2635–45. , eds. To err is human: building a safer health system.Washington, DC:National Academy Press,1999. .Adverse events in British hospitals: preliminary retrospective record review.BMJ2001; 322:517–9. .Effects of computer-based clinical decision support systems on physician performance and patient outcomes: a systematic review.JAMA1998; 280:1339–46. .Computerised reminders and feedback in medication management: a systematic review of randomised controlled trials.Med J Aust2003; 178:217–22. .Computerised advice on drug dosage to improve prescribing practice.Cochrane Database Syst Rev2001; 1: CD002894. .Computer support for determining drug dose: systematic review and meta-analysis.BMJ1999; 318:984–90. .Effects of computerized physician order entry and clinical decision support systems on medication safety: a systematic review.Arch Intern Med2003; 163:1409–16. .The impact of computerized physician order entry on medication error prevention.J Am Med Inform Assoc1999; 6:313–21. .A meta-analysis of 16 randomized controlled trials to evaluate computer-based clinical reminder systems for preventive care in the ambulatory setting.J Am Med Inform Assoc1996; 3:399–409. .Improving preventive care by prompting physicians.Arch Intern Med2000; 160:301–8. .Computer-based guideline implementation systems: a systematic review of functionality and effectiveness.J Am Med Inform Assoc1999; 6:104–14. .Audit and feedback versus alternative strategies: effects on professional practice and health care outcomes.Cochrane Database Syst Rev2000; 2: CD000260. .Interventions to implement prevention in primary care.Cochrane Database Syst Rev2001; 1: CD000362. .No magic bullets: a systematic review of 102 trials of interventions to improve professional practice.CMAJ1995; 153:1423–31. .Strategies for the implementation of cervical and breast cancer screening of women by primary care physicians.Gynecol Oncol2001; 83:186–97. .Closing the gap between research and practice: an overview of systematic reviews of interventions to promote the implementation of research findings. The Cochrane Effective Practice and Organization of Care Review Group.BMJ1998; 317:465–8. .Effectiveness of interventions to enhance physician screening for breast cancer.J Fam Pract1995; 40:162–71. .Single and combined strategies for implementing changes in primary care: a literature review.Int J Qual Health Care1994; 6:115–32. .Effectiveness of interventions designed to increase mammography use: a meta-analysis of provider-targeted strategies.Cancer Epidemiol Biomarkers Prev1999; 8:759–67. .Interventions that increase use of adult immunization and cancer screening services: a meta-analysis.Ann Intern Med2002; 136:641–51. .Interventions used in disease management programmes for patients with chronic illness—which ones work? 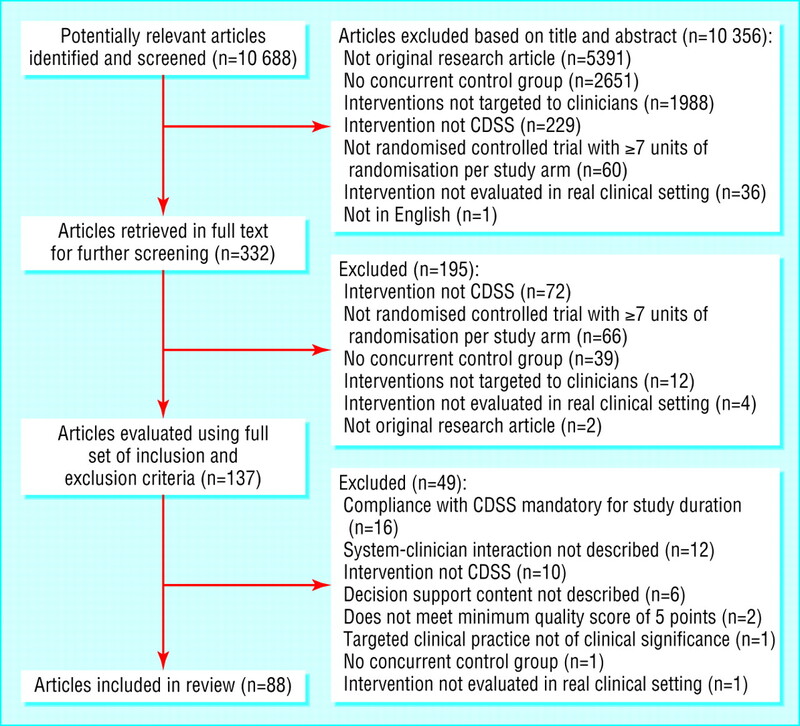 Meta-analysis of published reports.BMJ2002; 325:925–32. .Evaluating informatics applications—some alternative approaches: theory, social interactionism, and call for methodological pluralism.Int J Med Inf2001; 64:39–56. .Dissemination of effectiveness and outcomes research.Health Policy1995; 34:167–92. .Decision support in medicine: a survey of problems of user acceptance.Stud Health Technol Inform2000; 77:852–6. .Lessons learnt from bringing knowledge-based decision support into routine use.Artif Intell Med2002; 24:195–203. .Clinical decision support systems for the practice of evidence-based medicine.J Am Med Inform Assoc2001; 8:527–34. .Computer decision support systems.Chest2000; 118:47–52S. .A design model for computer-based guideline implementation based on information management services.J Am Med Inform Assoc1999; 6:99–103. .A consensus statement on considerations for a successful CPOE implementation.J Am Med Inform Assoc2003; 10:229–34. .Development and implementation of computerized clinical guidelines: barriers and solutions.Methods Inf Med2002; 41:435–42. .Lessons from experienced guideline implementers: attend to many factors and use multiple strategies.Jt Comm J Qual Improv2000; 26:171–88. .Ten commandments for effective clinical decision support: making the practice of evidence-based medicine a reality.J Am Med Inform Assoc2003; 10:523–30. .Appendix A: electronic decision support activities in different healthcare settings in Australia. In: National Electronic Decision Support Taskforce Electronic decision support for Australia's health sector.Canberra:Commonwealth of Australia,2003.www.ahic.org.au/downloads/nedsrept.pdf (accessed 28 Jan 2005). .A coefficient of agreement for nominal scales.Educ Psychol Meas1960; 20:37–46. .Evaluation of a computerized diagnostic decision support system for patients with pneumonia: study design considerations.J Am Med Inform Assoc2001; 8:473–85. .Paediatric clinical decision support systems.Arch Dis Child2002; 87:361–2. .Clinical application of two computerized diabetes management systems: comparison with the log-book method.Diabetes Res1992; 19:97–105. .Medical informatics: improving health care through information.JAMA2002; 288:1955–8. .Electronic technology: a spark to revitalize primary care?JAMA2003; 290:259–64. .Can computerized risk profiles help patients improve their coronary risk? The results of the coronary health assessment study (CHAS).Prev Med1998; 27:730–7. .Medical diagnostic decision support systems—past, present, and future: a threaded bibliography and brief commentary.J Am Med Inform Assoc1994; 1:8–27. .Academia and clinic. Developing and implementing computerized protocols for standardization of clinical decisions.Ann Intern Med2000; 132:373–83. .Improving clinical decisions and outcomes with information: a review.Int J Med Inf2001; 62:1–9. .Philosophies for the design and development of clinical decision-support systems.Methods Inf Med1993; 32:1–8. .Lessons learnt from the field trial of ACORN, an expert system to advise on chest pain. Proceedings of the Sixth World Conference on Medical Informatics,Singapore 1989:111–5. .Clinical reporting to primary care physicians leads to increased use and understanding of bone densitometry and affects the management of osteoporosis. A randomized trial.Ann Intern Med1998; 128:996–9. .Does a fixed physician reminder system improve the care of patients with coronary artery disease? A randomized controlled trial.West J Med2001; 175:165–6. .Practical approaches to providing better preventive care: are physicians a problem or a solution?Am J Prev Med1988; 4:27–48. .Office-based interventions to improve delivery of cancer prevention services by primary care physicians.Cancer1993; 72:1100–12. .Can residents be trained to counsel patients about quitting smoking? Results from a randomized trial.J Gen Intern Med1991; 6:9–17. .Improving delivery of preventive health care with the comprehensive annotated reminder tool (CART).J Fam Pract2001; 50:767–71. .Can computerised decision support systems deliver improved quality in primary care?BMJ1999; 319:1281–3. .Cluster-randomized, controlled trial of computer-based decision support for selecting long-term anti-thrombotic therapy after acute ischaemic stroke.QJM2003; 96:143–53. StatXact [computer program]. Version 6.2.0.Cambridge, MA:Cytel Software,2004. .Refining binomial confidence intervals.CanJStat1986; 14:113–29. .On small-sample confidence intervals for parameters in discrete distributions.Biometrics2001; 57:963–71. .How many subjects does it take to do a regression analysis?Multivariate Behav Res1991; 26:499–510. LogXact [computer program]. Version 5.0.Cambridge, MA:Cytel Software,2002. .Multivariable prognostic models: issues in developing models, evaluating assumptions and adequacy, and measuring and reducing errors.Stat Med1996; 15:361–87. .Personal paper: beliefs and evidence in changing clinical practice.BMJ1997; 315:418–21. .Implementing findings of medical research: the Cochrane Collaboration on Effective Professional Practice.Qual Health Care1995; 4:45–7.